Moving a family poses numerous unique challenges. In addition to the challenges presented by moving more belongings and working with the logistics of schools and jobs, you must also consider how best to keep your kids occupied, happy, entertained and safe during the process. If you have younger children who cannot provide much in the way of packing, loading or driving help, your primary concern may be to simply keep them occupied and away from any potential hazards. In this blog, we provide guidelines to keep your children content and out of harm’s way during each step of the process as you move your family. Preparing your home and belongings for moving day requires a large amount of work that can be made even larger if you have children too young not to pull toys right out of their boxes. Use the following tactics to invite your children to help or to entertain them elsewhere. 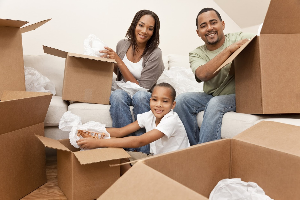 If the prospect of boxing up your entire life while watching your children seems daunting, consider hiring professional packers to handle some or all of the packing work. This choice allows you to spend more time with your children in the days leading up to the move, which can in turn allow you to better prepare them for the transition and can minimize their disappointment at spending less time with you during loading and traveling. Use your children’s natural curiosity to your advantage. When you’re packing in an area with few or no breakables or hazards, let your children explore the items you haven’t reached yet. For example, let your kids turn pots and pans into drums while you wrap and crate up dinnerware. You can also encourage kid construction projects with packing materials like empty boxes, tape, or markers. Just be sure you have enough to finish the job once playtime is over! If you want to get your children more involved, plan short activities that help you make progress. For example, you could hold a competition to see who could toss the most toys into a box in an allotted time period. In addition to these strategies, you may also want to plan your packing schedule so that you have blocks of uninterrupted time to spend with your children, especially around mealtime and bedtime. Kids are less likely to become bored, distracted or destructive if they can actively engage with a loved one periodically. The loading stage is perhaps the most difficult when you have children. Many things happen at once and children can end up underfoot or too far out of sight easily. Use the following methods to keep them happy and safe while you fill up the truck. One of the easiest ways to keep kids entertained during the loading portion of moving day is to take them somewhere else. Your away activity could be anything, from a visit to grandma’s to a day at an amusement park. Away activities are ideal if you’re trying to load up in one day or have children too young to safely navigate the house while the moving team works. If you can’t spare your spouse or decide on an away activity, put together a haven room for your children. Fill this space with activities your children love so that they can stay out of the work zone without becoming bored. If your children need supervision, have a parent stay with them or call in a babysitter. Your haven needn’t be indoors. If the weather is nice, send your kids out for some fun in the backyard. Use your imagination and your children’s interests to keep them entertained. If your children want to help but can’t do any heavy lifting, have them load up your personal vehicle, put food for traveling in the cooler or handle other small-scale tasks that they can be proud of without accidentally bumping into an adult carrying boxes. As you plan the traveling portion of your move, think of the trip the same way you would think of a vacation. Give yourself plenty of travel time and activity ideas so your children have an array of choices and you feel less pressure. You may also plan breaks or sightseeing stops so your children feel less confined during the travel. If you’re flying or taking a train, look for activities to do during any layovers that can make the trip feel like an adventure. Use these ideas to find child-friendly solutions that keep your kids occupied during the moving process. To get expert help and recommendations on your household move, partner with the team at Wheaton World Wide Moving.